Fanatic illegal Israeli colonialist settlers have taken control of 40 dunams (10 acres) belonging to a Christian church, between the Gush Etzion settlement bloc and the al-‘Arroub refugee camp, north of the southern West Bank city of Hebron. The settlers have started establishing a new outpost on the confiscated land referred to as Bet Bracha. According to a report by Israeli newspaper, Ha’aretz, right-wing settler, Aryeh King, has purchased a compound of an abandoned church, and started working on it to create a new outpost. Ha’aretz said that the settlers have been conducting massive reconstruction for the last several months. 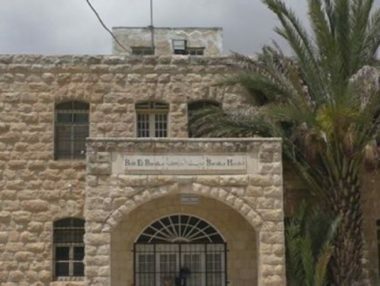 The settlers also built a fence around the compound, challenging an order by the Civil Administration Office in the Occupied West Bank, as no permit was issued for the fence. In addition, Ha’aretz stated that King does not need to obtain a permit for refurbishing the buildings, as they were built in the 1940s, close to settlement route #60. The importance of the new outpost is that it paves the way for further settlement expansion, especially since there are more than 500 dunams (around 125 acres) of Palestinian lands illegally confiscated by Israel in 2005, used to expand kibbutz Migdal Oz. Israel is also planning to build a settlers’ road bypassing the al-‘Arroub refugee camp. In 2008, the Israeli Civil Administration Office in the Occupied West Bank mapped the entire area, but did not have a plan in place for it at the time. According to Ha’aretz, the church was turned into a hostel twenty years ago, but the project failed, and the buildings were left abandoned. An American missionary, identified as Thomas Lambie, constructed the buildings after coming to Palestine in 1947. Lambie constructed a tuberculosis hospital on the site, and was buried on the property after his death in 1954. The new outpost would also facilitate future expansion after becoming part of the Gush Etzion settlement bloc, allowing it to extend toward the Hebron hills, particularly since Israel claims to have ‘state lands’ in the area. It is worth mentioning that Ha’aretz quoted an unnamed source from the Gush Etzion Regional Council stating that the church property does not belong to the settlement, as it is owned by a Swedish church. Meanwhile, Dror Etkes of the Israeli Peace Now Movement, Shalom Achshav, said Prime Minister Benjamin Netanyahu has the opportunity to declare clearly whether he supports, or opposes, the two-state solution. Etkes added that the new outpost is located on an important route linking Bethlehem and Hebron. The route has further obstructed efforts to achieve a peace agreement with the Palestinians. Israel uses the claim of ‘state lands’ in the occupied West Bank to justify the construction and expansion of its illegal colonial settlements, isolating entire Palestinian communities, and preventing Palestinians from accessing what is left of their lands and orchards. However, most of the settlements in the West Bank are built on privately owned Palestinian lands, and the Israeli ‘state lands’ claim violates International Law and the Fourth Geneva Convention regarding the transfer of a civilian population of the occupying power into lands it occupies.